May is almost with us and the predominantly Northerly winds persist making it cold but clear. The race officer Alan Grose set up the clubhouse start for a Northwest group on the first of the Cockwells Saturday points series. The first round was Vilt to starboard and Carricknath to starboard. This entailed a spinnaker run out of the harbour and a gybe after Vilt with a further kite run to Carricknath, then a long beat against the falling tide back to the club and the turning mark. Four boats turned out for Q class and at 1355 hrs they set off from the club line. Scorpion and General Khaos flew spinnakers. Minx and Tia Mo Shan deciding not to. Both Scorpion, Geoff Davis and General Khaos, Ian Jakeways were fully crewed up. 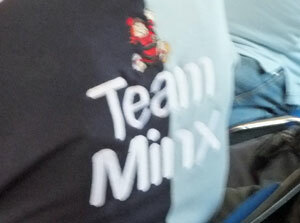 Minx, Charles Choak, were all wearing their new livery, suggesting they were all geriatric sailors. Tai Mo Shan saw Niel Chamberlain on his own giving a spirited performance. We followed in U class at 1400 hrs and the line was quite busy with seven of us vying for position. 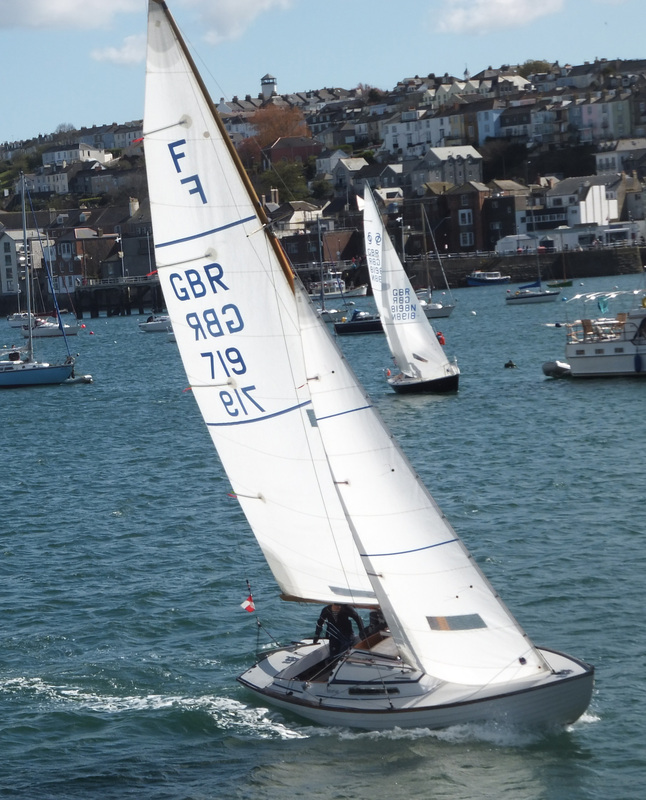 In Trifle, Chris Jelliss, we kept to the Falmouth side of the fairway and hoisted a port pole spinnaker. Inside us was Nigel Rowe in Kaimana with a genoa goose winged but starboard mainsail. Wilkie, Bob Chapple was over enthusiastic and over the line at the start so had to go back to start again, a pain as he was only double handed. Aurora, Mandy Owen was on starboard kite on the Flushing side of the fairway and established an early lead. Two Hawk 20s, Ida, Mike Swingler and Mr G, Tim Dewhurst were second row runners in the melee. A lone W class boat, this time Amneris, Mike Robson took off later and had a sail over. It will be great when Sweet Friday, Thirteen and Amneris all come out together and have a real battle. Q class struggled with the wind coming more from the east as they went toward Vilt thus making them drop their kites and go on genoa. The shifting wind was kinder to us in U fleet and we held our spinnakers all the way. Aurora just holding off Trifle to the buoy. Q class split as they went downtrack and it was difficult to see who was ahead of whom from our position, besides we were concentrating on getting past Aurora. The ebb tide albeit a neap was still significant and we elected to go low on port pole after rounding Vilt then head for East Narrows thus keeping in the tide. Scorpion in Q class appeared to use this tactic while the others went high. Aurora went high on a starboard pole having gybed. We were first around the Carricknath buoy by a whisker and the beat back to the turning mark started. On the radio General Khaos had to be reminded by the race office that there was a shortened course and second round! It's club racing and we want boats to compete and crews to enjoy the fun. Aurora rounded ahead of Trifle having had a better beat up the Harbour. Kaimana was closing up rapidly behind us. The second round was Black Rock buoy to starboard and return. We had a battle royal up the Harbour with Aurora having overtaken and caused her to dip us on one tack. General Khaos won line honours but was beaten by Scorpion into second place on handicap in Q class. Aurora beat Trifle on the water and by a large margin on handicap. Kaimana came third. Bob Chapple in Wilkie had to retire. Amneris had the inevitable sail over. A great day on the water with good wind, great weather, and tea and cakes provided by Dan and Polly Tregaskes.